Poll: Should we finish the Santiago Creek bike trail in Fisher Park? UPDATE: Now YOU can vote to support the completion of the portion of the Santiago Creek bike trail that runs through Santa Ana’s Fisher Park neighborhood. Click here to vote! 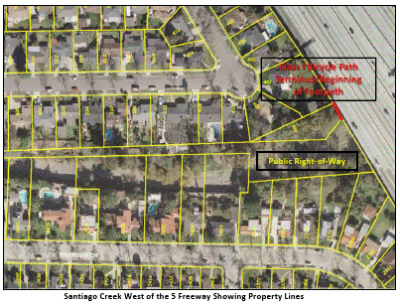 Did the Fisher Park NIMBYs who are blocking the completion of the Santiago Creek bike trail ruin their own neighborhood? It is a fair question to ask. 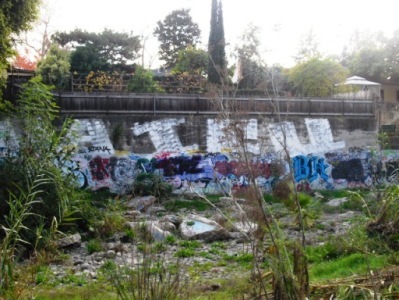 If you visit the Santiago Creek bike train in Santiago Park – or over at the Santiago Park Nature Reserve, you won’t see the horrible graffiti that is sprayed all over the place in the Fisher Park Neighborhood. Sure, you will find isolated tagging, but nothing like the disaster at Fisher Park.